" We want to help every golfer experience the same feeling of tempo and rhythm the Pros do! " Craig has over 30 years of experience in instrumentation, circuit design and has 6 different Patents in controls, electronics, and manufacturing fields. Out of sheer jealousy he was determined to invent a golf club that could transfer the Tempo, Lag and Rhythm of the best players in the world to the rest of us. 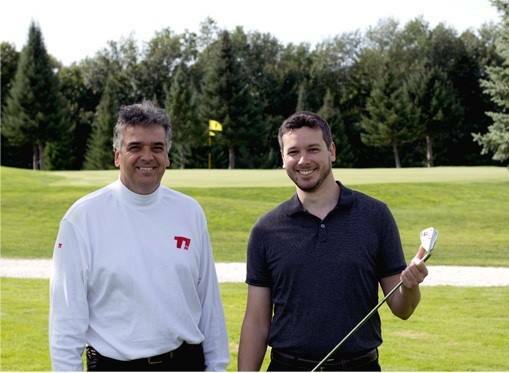 Using swing analysis software he studied and measured a library of professional golf swing videos and then created a sound file that was justified to the actual timing of his favorite professional golfer. Craig had created the first ProTrack capturing Back swing, Lag, and Strike. Using a circuit board from an answering machine, a speaker mounted in a cavity backed 5 iron, and a trigger circuit to sense the start of a golf swing, the first Ti prototype came to life. It was ugly, but it worked great as a practice club. It was surprising to discover just how quickly the Pro's swing. It took a little while to absorb the new tempo but it improved his ball striking and greens in regulation by 2 in the first month. (Fast forward, since inventing the TI Craig's handicap has gone from 14 to 8 ) Craig took videos of others swinging with and without the device, and then washed the videos through his editor and same analysis. The results convinced him he needed to patent his creation, fast. Craig wrote and prosecuted the patent for his idea in 2005 and it was granted with all its claims intact in 2007. Developed with his son Scott, who has his own wide range of technical and design skills, the TI™ became a reality. No longer an answering machine taped to a club the Ti is a precision electronic device in the form of a club. Every aspect of our design and construction is focused on ease of use and durability. The club head is a sole weighted cavity back six iron chosen for universal ease of use. We chose the more expensive cured Polyurethane molded plastics over more simple Polystyrene, The speaker is the highest quality, tied diaphragm and shock proof version available. All of the circuitry is hand soldered to ANSI standard IPC/EIA J-STD-001C and inspected 3 times. The entire club and parts are not only fastened but are in addition epoxied. Only after wearing out many gloves and hitting thousands of balls did we put the TI into production. Now, players of all abilities can quickly improve their game on their own and harness the power of a professional golf swing. We've placed the rhythm and tempo of the worlds greatest golfers in a hittable club, and now it's available to you.